Brunch…it’s what for lunch on today’s date. 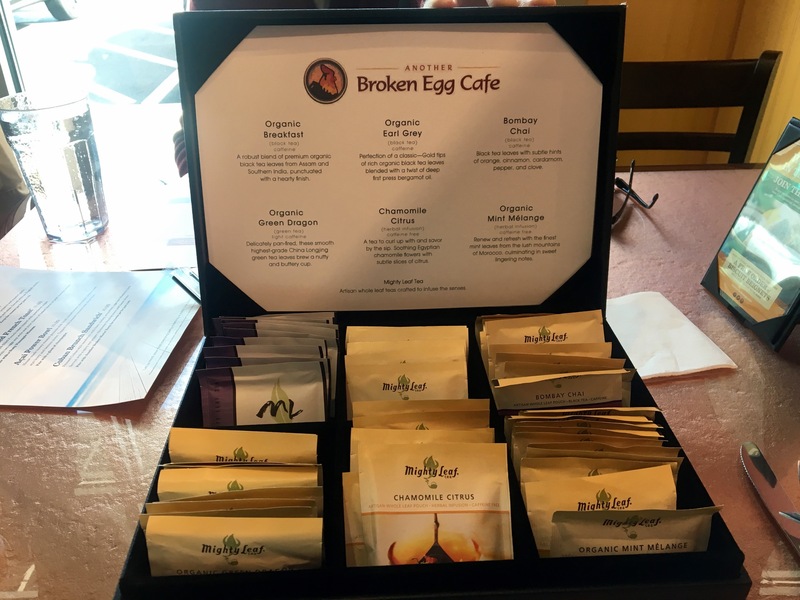 We are in Roswell at the invitation of Another Broken Egg to check out their newest location. This makes six in the Atlanta area for the Louisiana-based chain of 57. 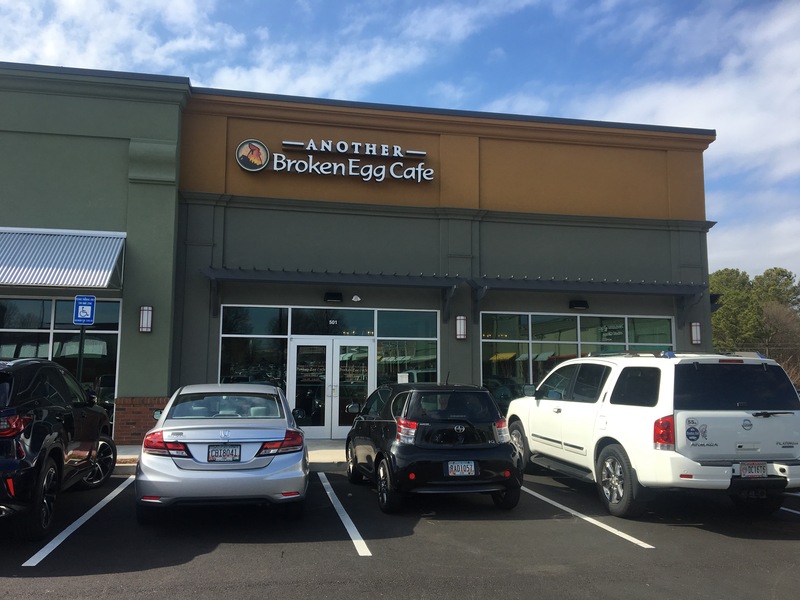 Alpharetta Highway has become another of our area’s concrete jungles and Another Broken Egg is right in the middle of it. Like that Hitchcock shot where you can see both of us in the picture? Let’s go inside and see what’s cooking. The first thing you notice is that there’s a bar right in the middle of the restaurant. You can get a mimosa or a beer here. You can’t do that in most restaurants like this. In case you were wondering, their most popular drink is the mimosa. No surprise there. For the more adventurous types, try the blueberry “lemonade”, a fruit puree made with lemon vodka. We are not boozing it up, but my tea-drinking date is very impressed with the tea selection. 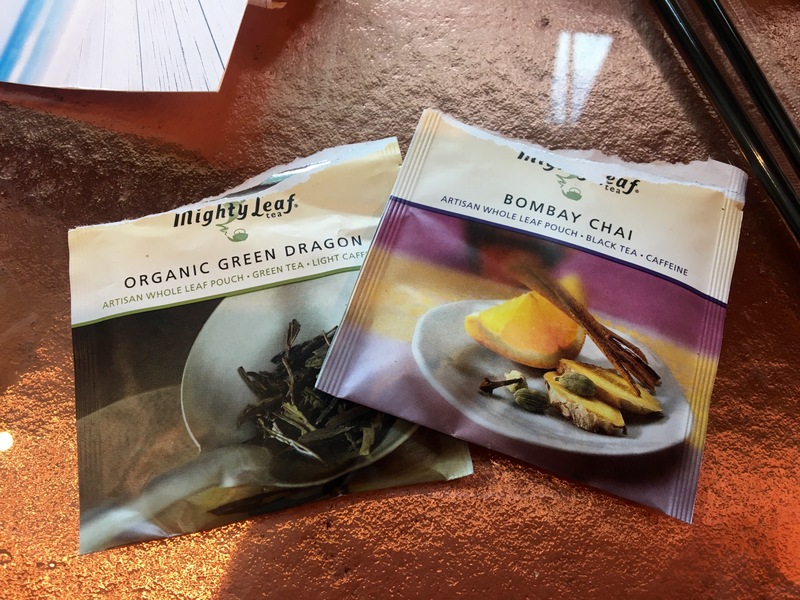 It’s Mighty Leaf tea, so you get one of those really nice sachets when you open up your packet. 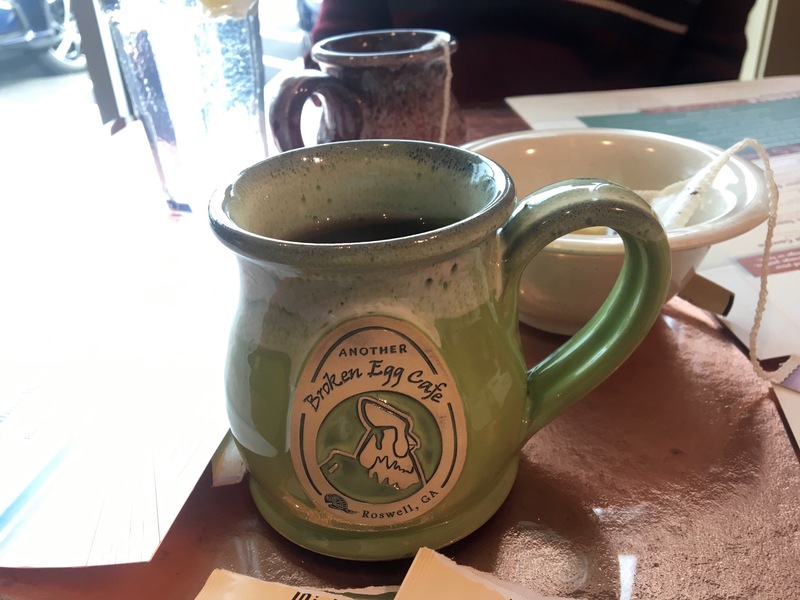 And the mugs are very cute. They should sell these. 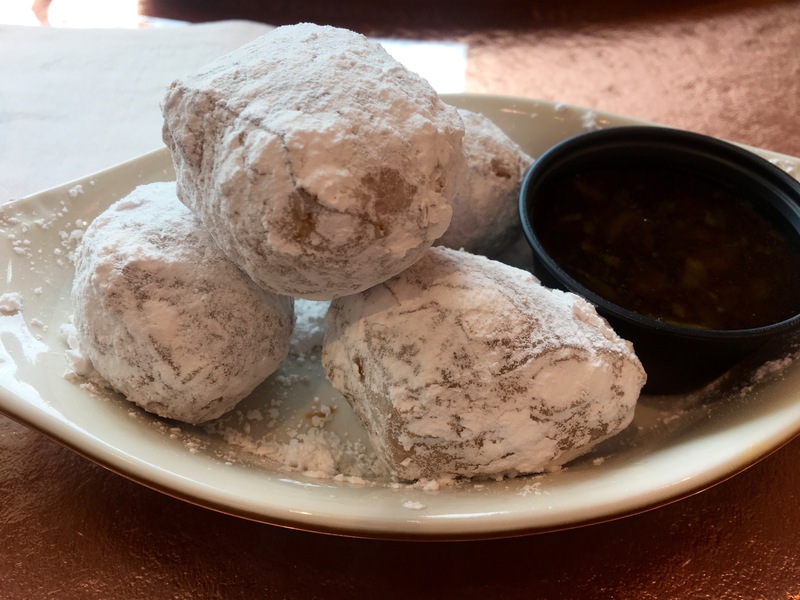 Here’s our tip for you–as soon as you arrive, get an order of biscuit beignets to munch on as you look over the menu. Instead of the usual beignet dough, these are made with biscuit dough. Then it’s all fried and dusted with sugar. Dip it in the honey sauce and let the good times roll. It’s tough to pick from the menu. Everything that’s coming out of the kitchen looks great. 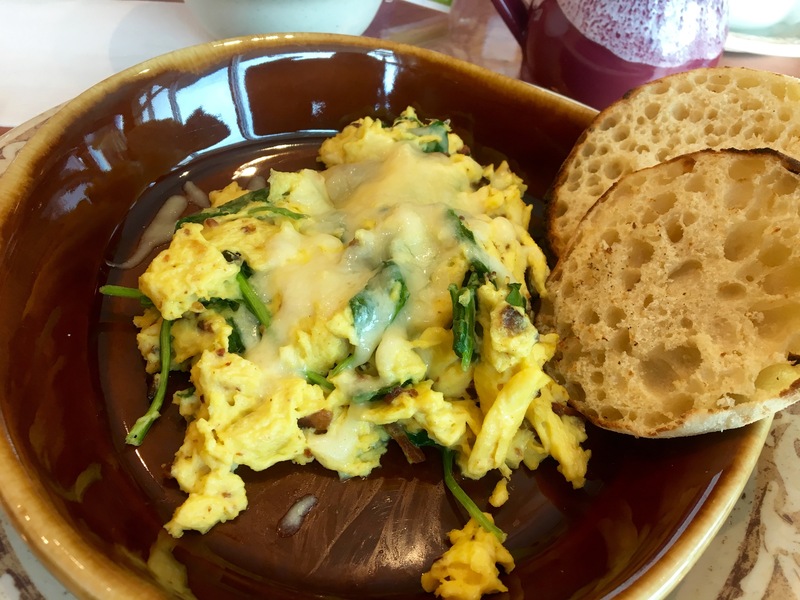 We go for some of the breakfast items because you can get a burger or a salad anywhere. I go for the “Popeye” scrambler. There’s a ton of spinach inside. My biceps feel much larger as I eat this nice dish. Can’t decide which pancake to get? 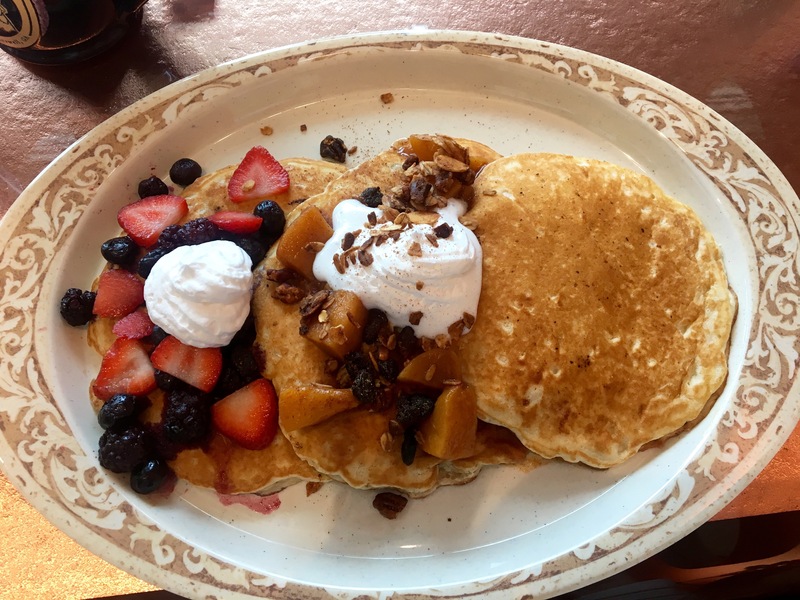 They make it easy for you with the pancake trio sampler. Eve gets a plain buttermilk, an apple, and a mixed berry. You won’t leave hungry after eating this, because it also comes with a side dish. 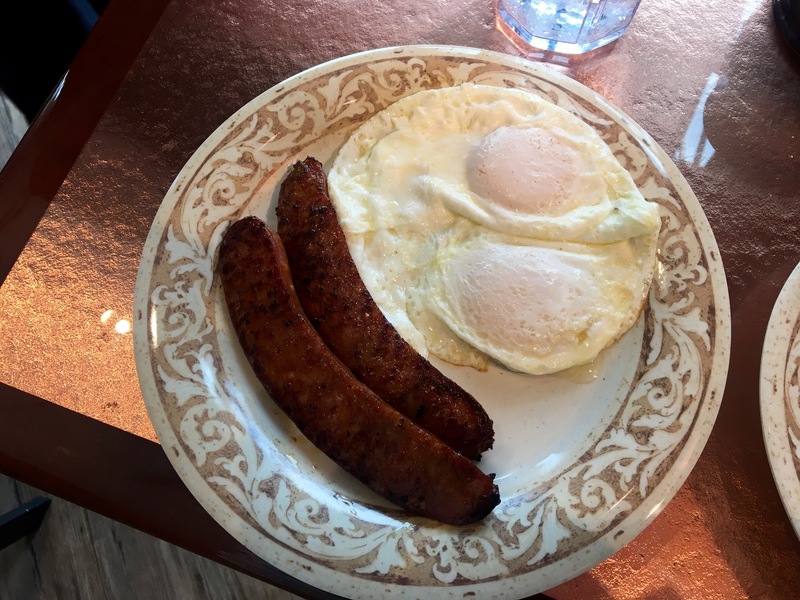 Two eggs over easy and a side of andouille sausage (remember, the chain started in Louisiana) complete the order. Sure, it’s a lot of food, but this is brunch and you probably skipped breakfast to eat it. We leave the restaurant full and very satisfied with our choices from a vast menu. 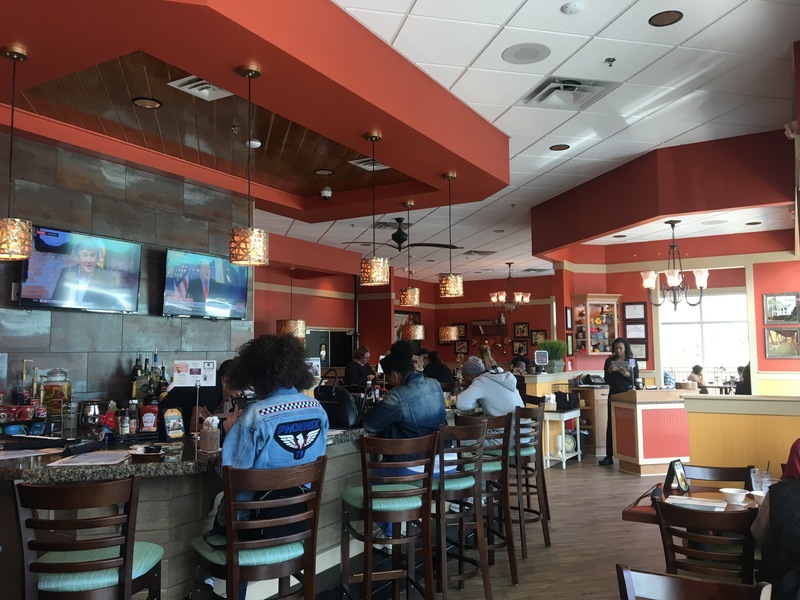 The bottom line on Another Broken Egg Cafe: Go out to eat on the weekends at around 11:00AM and you will see what a brunch town Atlanta is. 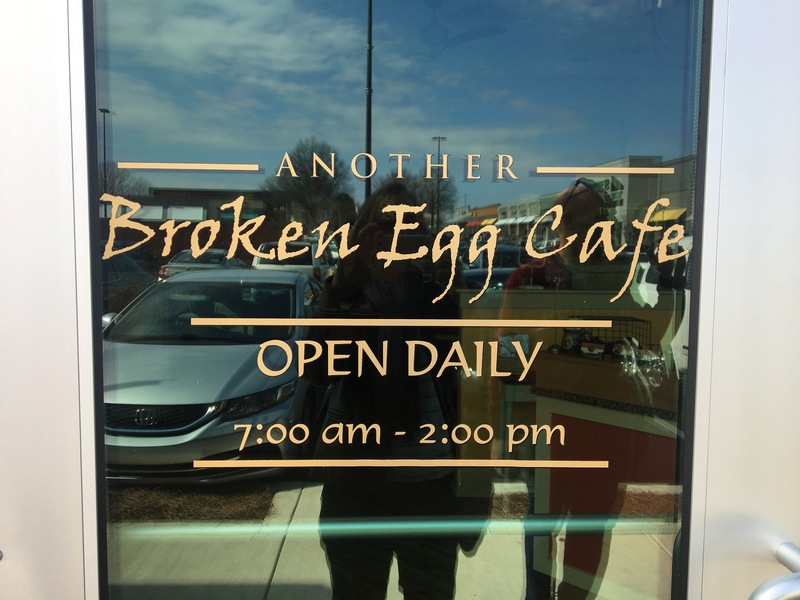 Another Broken Egg is busy on the weekends and we can see why. Everyone who works here is pleasant and their joy rubs off on the customers. Add to that some good food, and you have a winner. With over 100 choices on their menu, they really have something for everyone. Disclaimer time: Because we were guests of Another Broken Egg Cafe, we did not pay for our meals. Our words, however, are priceless. Thanks to Bar Manager Evan, one of the most friendly people we have met in a restaurant, for taking such good care of us and for answering all of our questions. We should also give a shout-out to Hannah Baumgarten of Green Olive Media for setting this event up.